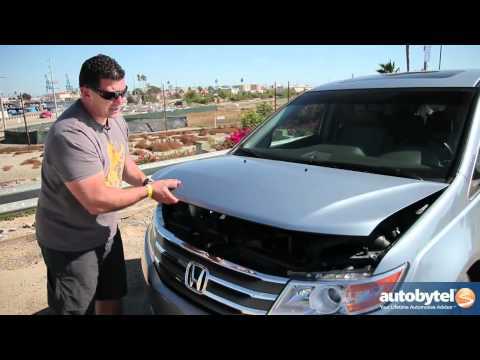 Regarded by many as the pinnacle of the minivan class, the 2012 Honda Odyssey minivan enjoys an excellent reputation for safety, resale and reliability, but that's only the beginning. It also offers impressive creature comforts, easily accessible seating, and it is one minivan that is actually fun to drive. Providing an extra hand when you have your hands full. Our Honda makes getting around with two young children a breeze. The automatic doors and trunk are great when carrying a child. The collapsible third row means we have plenty of room for bringing everything a family of four could need on any adventure. The only service issues we have had with our Honda has been Honda issued recalls, which our local service center handled without issue. Six years in, the doors and trunk are starting to squeak when opening, but not to the point that we are concerned. We removed the center seat from the second row, so the kids can enter from the truck to get into their seats. This is great for when carrying bags. We just open the trunk, put the kids in, then the bags. The middle row, middle seat is able to be taken out and captain seats are left for ease in climbing in and out of the back seat. My van is a gray color with gray leather on the inside. We asked for the weather tech flooring a few years ago for Christmas and added that instead of carpet flooring. It has been nice to be able to clean up spills and messes with three kids in the back. We LOVE the DVD system and it is so helpful for longer trips. Another feature of our van that I really enjoy is the middle row middle seat can be taken out to allow for captain seats. This easily allows my bigger kid to climb in and out of the van. I feel safe driving the van and the gas mileage is pretty good as well. It is reliable and an all-round great van, especially for bigger families. Honda is recalling certain model year 2012-2013 CR-V, Odyssey, and model year 2013 Acura RDX vehicles. During sub-freezing temperatures, the brake-shift interlock blocking mechanism may become slow and allow the gear selector to be moved from the Park position without pressing the brake pedal. As such, these vehicles fail to conform to the requirements of Federal Motor Vehicle Safety Standard 114, "Theft Protection and Rollaway Prevention." If the gear selector is moved from the park position without pressing the brake pedal it can allow the vehicle to roll away, increasing the risk of a crash. Honda will notify owners and instruct them to take their vehicle to a Honda or Acura dealer. The dealer will install an updated brake shift interlock blocking mechanism free of charge. The recall began on May 13, 2013. Owners may contact Honda at 1-800-999-1009. Honda's campaign recall numbers are S96, S97, and S98. Honda is recalling certain model year 2009-2013 Pilot and 2011-2013 Odyssey passenger vehicles manufactured from March 13, 2008, through December 21, 2012. One or more rivets that attach the airbag module to the airbag cover may be missing. The absence of more than one rivet could alter the performance of the driver's airbag during deployment. This could potentially increase the risk of injury during a crash. Honda will notify owners and instruct them to take their vehicle to a Honda dealer. The dealer will inspect the driver's airbag module and replace it if necessary, free of charge. The recall is expected to begin on, or about, February 21, 2013. Owners may contact Honda at 1-800-999-1009. HONDA IS RECALLING CERTAIN MODEL YEAR 2012, ODYSSEY VEHICLES MANUFACTURED FROM OCTOBER 31, 2011, THROUGH NOVEMBER 30, 2011. THE RETENTION NUT FOR THE FRONT RIGHT LOWER SUSPENSION DAMPER BOLT MAY NOT HAVE BEEN TIGHTENED TO THE PROPER TORQUE, POTENTIALLY ALLOWING THE NUT TO LOOSEN. IF THE NUT LOOSENS, THE FRONT HUB ASSEMBLY WOULD ONLY BE ATTACHED BY ONE BOLT, ALLOWING THE WHEEL ASSEMBLY TO SHIFT TO AN EXTREME INWARD ANGLE, RESULTING IN A LOSS OF STEERING, INCREASING THE RISK OF A CRASH. HONDA CONTACTED ALL NINE OWNERS BY PHONE ON DECEMBER 19, 2011, AND REPAIRED THE VEHICLES AS NECESSARY FREE OF CHARGE. OWNERS MAY CONTACT HONDA AT 1-800-999-1009. Honda (American Honda Motor Co.) is recalling certain 2011-2017 Honda Odyssey vehicles. The second row outboard seats can slide sideways to one of two positions. If a seat is placed between either of the two positions when attaching the seat to the vehicle floor, the seat will not latch properly to the seat striker, allowing the seat to tip forward unexpectedly during braking. If the seat tips forward during braking, it can increase the risk of injury. The remedy for this recall is still under development. Honda will notify owners of the safety risk in an interim notification and provide detailed instructions for installing/positioning the second row outer seats and confirming that they are securely latched. Once a final remedy is determined and the necessary parts are available, Honda will send a second letter to the owners to have them visit a dealer to have the condition remedied, free of charge. The interim notification is expected to begin December 18, 2017. Owners may contact American Honda Customer Support & Campaign Center at 1-888-234-2138. Honda's number for this recall is S0G. Honda (American Honda Motor Co.) is recalling certain model year 2011-2016 Odyssey vehicles manufactured August 17, 2010, to October 1, 2015. The affected vehicles have second row outboard seats that have a release lever that allows the seats to move for easier access to the third row of seats. This release lever may remain in the unlocked position allowing the seats to move unexpectedly. An unlocked second row outboard seat increases the risk of injury to the seat occupant during a crash. Honda will notify owners, and dealers will install an additional bracket and spring to both second row outboard seats, free of charge. The recall is expected to begin January 23, 2017. Owners may contact Honda customer service at 1-888-234-2138. Honda's number for this recall is KD5.